A number of outstanding childcare professionals recently gathered to attend the Bournemouth Early Years Awards evening, where ‘Bournemouth’s childcare heroes’ were announced. A number of representatives from Tops Day Nurseries outstanding settings were in attendance as well as representatives from the Head Office in Southbourne. During the ceremony Operations Director, Amy Alderson gained a special recognition award for her key role in representing the Early Years Sector in a bid to help the Bournemouth, Poole and Christchurch Local Authorities combine their policies and procedures before the three local authorities combine. The steering group is particularly important to ensure that the new collaboration of the 3 LA’s retains the most effective processes and continues to offer the highest levels of care and education for the children. 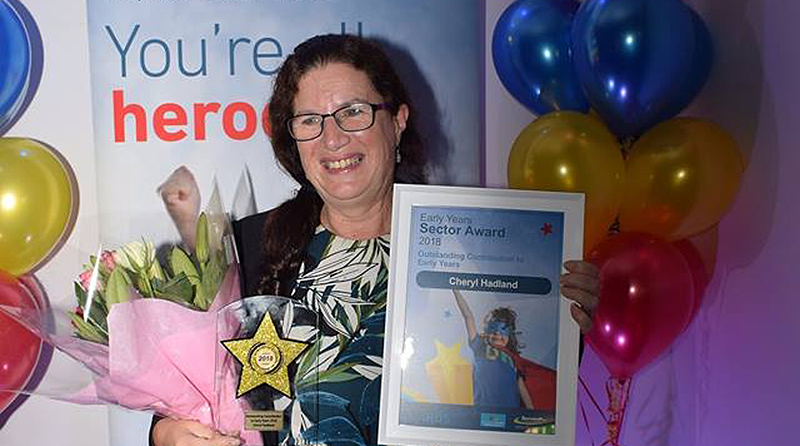 Multi award winning Managing Director of Tops Day Nurseries, Cheryl Hadland received an accolade for ‘Outstanding Contribution to Early Years’ to recognise all of the innovation, improvement and most of all inspiration she has given to the sector. Cheryl has spent 30 years in childcare, having opened the first ever Tops Day Nursery in Parkstone, in 1990, with 4 children and now caters for over 4000 across 28 settings. This award follows on from the national ‘Most Inspirational Person in Childcare Award’ that Cheryl won in 2018, presented by the National Day Nurseries Association. Cheryl is an astonishing role model, international speaker on eco-sustainable day nurseries, the founder of registered charity GECCO and founding organiser of the APPG for Early Years. As well as the operational influence Cheryl has had within the early years sector, she has lead and participated in All Party Parliamentary Groups with MP’s from across the UK. Cheryl played a part in changing the government’s decision on all Early Years Educators having to hold GCSE grades of A*-C, fairer funding rates following the implementation of the 30 hours funding scheme and sustainability. Cheryl commented “I am delighted to have been awarded the title of outstanding contribution to early years. Tops Day Nurseries are a family, and we all want the best start in life for the next generation. Cheryl has a passion for education not only for young children but for apprentices and adults. It has been through the continuous professional development and lifelong learning of colleagues that the Tops Family of Day Nurseries has expanded in the way that it has, and why all settings registered under the Tops Day Nurseries name is graded Good or Outstanding by Ofsted.